If you have been charged with a property crime like destruction of property arson or vandalism, you may not know where to turn for your defense. The financial consequences of property crimes can be intimidating, and can make you feel like there is no way out. Our criminal law team is here to help you face any property crime charges. We provide comprehensive representation from free consultation all the way through the final restitution hearing. Our founder, Attorney Christina L. Williams, has been handling criminal cases in Wyoming and South Dakota for more than 15years. She will carefully review all of the circumstances of your case and fully assess your legal options. Using her objective assessment, our criminal defense team will be help you to make an informed decision between accepting a plea agreement and going to trial. When you are facing charges for a property crime, you need an experienced criminal attorney who knows your particular court. Familiarity with the local courts is especially important in these cases because they often involve a physical location, more so than some other areas of criminal law. Ms. Williams is familiar with all the circuit, district, and municipal courts in nearby communities of Wyoming and South Dakota. She knows how to work with the prosecutors, judges, and court staff to make sure you get your day in court. In some cases, arson can lead to both state and federal charges. If someone was hurt or killed as a result of the fire, you could be facing even more serious charges. Our criminal defense team will spend time analyzing your case and all the evidence to inform you of all the possible consequences. Our experienced arson defense lawyer, Christina L. Williams, can negotiate with prosecutors to construct a plea agreement to avoid a federal conviction. When you are accused of destroying another person's property, you need someone who is willing to look closely at all the evidence. Our criminal defense team will carefully review police reports, videos, and other evidence to develop your strongest defense. In addition to the risk of jail or prison time, probation restrictions, and fines and costs, property crimes convictions carry with them the possibility of "restitution." This means that the criminal court may order you to pay the victim back for the value of the thing you damaged. If that item was a house or a car, you could be looking a thousands of dollars in restitution costs. Your property crime defense attorney can help ensure that the amount you are required to pay is appropriate. Read More: FAQs about the consequences of a criminal conviction. If you are facing charges of a property crime, our skilled criminal defense team is ready to get to know you and your situation. By getting us on the case early you can help protect your rights and ensure the best possible outcome. Call our office in Gillette, Wyoming at 307-686-6556 or contact us online to schedule your personalized case review and strategy session with our dedicated client care specialist. Credit cards are accepted. Spanish language services are available upon request. Servicios de traducción en español disponibles. 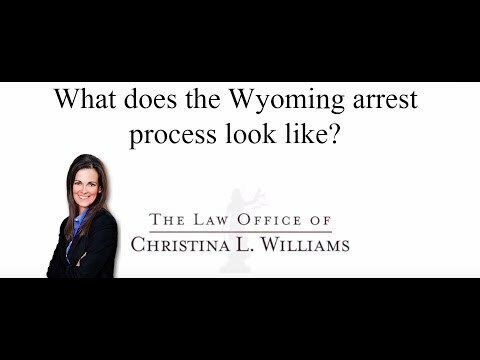 What does the Wyoming arrest process look like?